While carefully planned step-by-step instruction has always been integral to the botanical art instruction Margaret has designed, her curriculum planning and every course and workshop therein maintains a balanced approach to learning this art, one which she believes deepens a student’s understanding of visual art concepts that can see many develop greater creative flexibility and a higher quality of art. She strongly believes that all who want to learn how to draw and paint can do so, but by “learning to see through the eyes of an artist” a different more satisfying journey transpires, especially when inspired by the wondrous world of plants. Since moving to Italy in 2007 when her husband accepted a new job in Siena, Margaret continued as the Director of the Brookside School of Botanical Art & Illustration until retiring in 2015. An inspiring botanical art teacher, Margaret loves to share her creative ideas, knowledge and innovative techniques with beginners, experienced artists and teachers. Her teaching approach reflects four years of a classic style art schooling and her experiences as a professional natural science illustrator. She began teaching botanical art in 1988 for a community education program conducted at the Brisbane Botanic Gardens - Mt Coot-tha (MCBG). Her catch phrase for these earlier botanical drawing classes – “of course you can learn to draw!” Increasing demand for a fully comprehensive botanical art program saw the opening in 1997 of The Margaret Saul School of Botanical Art & Illustration, and within a year her classes were held in the newly built “seminar room” at the MCBG visitors centre. Three years after moving to the USA in 2000 when receiving an invitation to establish a school at Brookside Gardens, Maryland (near Washington DC) Margaret sadly disbanded her Brisbane school to focus on designing a curriculum that would see her directing a new school offering a certificate course but seeds had found fertile ground in her home state to see classes and exhibitions soon returning to the MCBG, this time run by the then newly established Botanical Art Society of Queensland (BASQ) and awareness for rare and endangered native flora continues through the work done by the Rare Plants Group. The broadening of interest in botanical art across the state is evident with the proliferation of botanical art groups and artwork of the highest quality - “beautiful art” is exhibited by members at the BASQ annual exhibition, “Floressence” and in the society’s online gallery. A school program took shape after learning that so many adults wanting to draw were hesitant to learn after being told at school they were hopeless at art or had art teachers who sadly had no basic drawing skills. 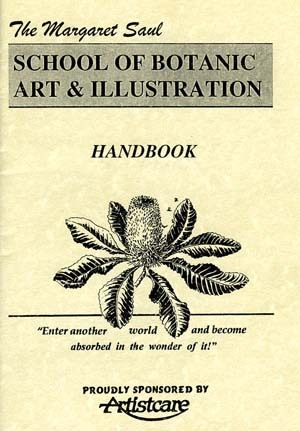 The Margaret Saul school program was outlined in its school handbook to provide crucial information for prospective students, and critical placement of its school brochures were a vital way of publicising the school (before access to the “www” was commonplace). The program included comprehensive courses in botanical drawing and painting from beginner through intermediate and advanced levels and each with a “green sheet” that included the aim of the course, weekly class content and homework. This information appealed to these adult learners. Workshops, some by visiting masters of the art and later, as students gained more advanced skills Margaret initiated the Garden’s Project to illustrate plants in the collection at MCBG and the Rare (native) Plants Project in association with the Queensland Herbarium. Students had ready access to the library at the MCBG visitors’ centre which had acquisitioned a number of books featuring botanical art and each school year culminated in an exhibition of botanical art by school participants that also included presentation of achievement awards at the exhibition openings. Future Teaching and Workshops in 2020 in Australia? Until then, please enjoy some pictures of the Tuscan home, Il Cappano, that we will be leaving behind. A wonderful opportunity to attend this school awaits, either to attend on a regular basis or for weekend workshops, in this greater Washington DC area destination set in tranquil, beautiful garden surrounds with easy parking close to the classroom. Participate in regular weekly courses of core instruction originally designed by Margaret Saul, and/or school workshops, all of which are presented by its faculty, many of whom attainted the school’s highly sort after BGSBAI certificate. Register for BGSBAI Classes: Registration for the Fall/Winter classes open in August and the Spring/Summer classes in February.